We have three more days of my challenge – I am sharing with you my exploration of The Language of Leadership. Unearthing and analysing the words which we choose to use to express our leadership. I’ve already traveled the whole ‘English’ alphabet and we’re half way through the five important vowels. My offer earlier this month, for ‘I’ were three words: Inspire, Influence & Impact. I actually use these words to explain leadership and what I do as a Leadership Intelligence Mentor. There was great involvement with the letter ‘I’, many of you offered your important words, including: integrity, innovation, imagination, ideas, improvement and inclusion. What a great list and the reasoning was enlightening. My one additional word is painstakingly obvious and it can irradiate leadership and the team culture ruthlessly. The word is ‘I’. Yes, the often used pronoun which opens the window to the soul of the narcissist. That might seem rather drastic, however when it comes to personality intelligence, we’re seeing more and more narcissists in our circles of influence. 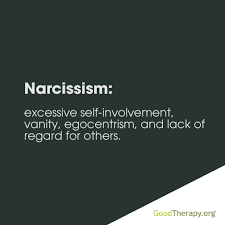 According to results of the Narcissistic Personality Inventory, (NPI) we’re seeing a an increase within the inventory which indicates an inclination of narcissistic behaviour. The change in the spectrum is increasing yearly. Think of Donald Trump! He’s an ‘I’ man and demonstrates of the narcissistic traits. The lesson here is, be more alert to your use of ‘I’ and consider who else was involved in the work or result of what has occurred or achieved. Move from ‘I’ to ‘we’ is what we suggest on many levels of leadership development. What are your ‘I’ words? We’re all eager to hear and broaden our leadership vocabulary. Tomorrow is ‘O’ … start scanning that brain of yours to identify the words beginning with this vowel. The Language of Leadership game is more fun when more people participate.